The pressure distribution in the lubricant of the bearings (rainbow color plot), von Mises stresses (blue color plot), and displacement of the bearings (Orbit plot) resulting from a rotordynamics analysis. The study of rotordynamics is important in application areas that involve rotating machinery, such as the automotive and aerospace industries, power generation, and the design of electrical products and household appliances. The physical behavior of rotating machines is greatly influenced by vibrations, which are exacerbated by the rotation and structure of the machines themselves. Perfectly symmetrical rotor assemblies exhibit different natural frequencies as a function of rotational speed, while imperfections and unbalances can excite these frequencies in intricate ways. When designing machinery with rotating parts, you need an efficient way to consider these behaviors and optimize operation and performance. You can use the Rotordynamics Module, which is an expansion to the Structural Mechanics Module, to analyze the effects of lateral and torsional vibrations of rotating machinery in order to study rotor vibrations and contain their levels within acceptable design limits. Among the different design parameters you can evaluate with this module are critical speeds, whirl, natural frequencies, stability thresholds, and the stationary and transient responses of a rotor due to mass unbalances. You can also see how rotational behavior may lead to stresses in the rotor itself, as well as additional loads on and vibration transmissions to other parts of the rotating machine's assembly. With the Rotordynamics Module, you can take into account the effects of various stationary and moving rotor components, including disks, bearings, and foundations. You can also easily postprocess your results directly within the software environment, presenting them as Campbell diagrams, modal orbits, harmonic orbits, waterfall plots, and whirl plots. The von Mises stresses and an orbit plot of the different bearings for a crankshaft, using the Solid Rotor interface. Whirl plots are used in the analyses of rotating machine rotors that are simulated using beam elements. The path traveled by the components, such as bearings and disks, can also be included in such plots. Campbell plots show variations of natural frequencies of a rotor with respect to the rotor speed. In the forward whirl, the eigenfrequency increases with the rotor speed. In the backward whirl, the eigenfrequency decreases with the rotor speed. As a result, natural frequencies cross over each other with increasing rotor speed (right). A waterfall plot showing the displacement of one of the bearings. 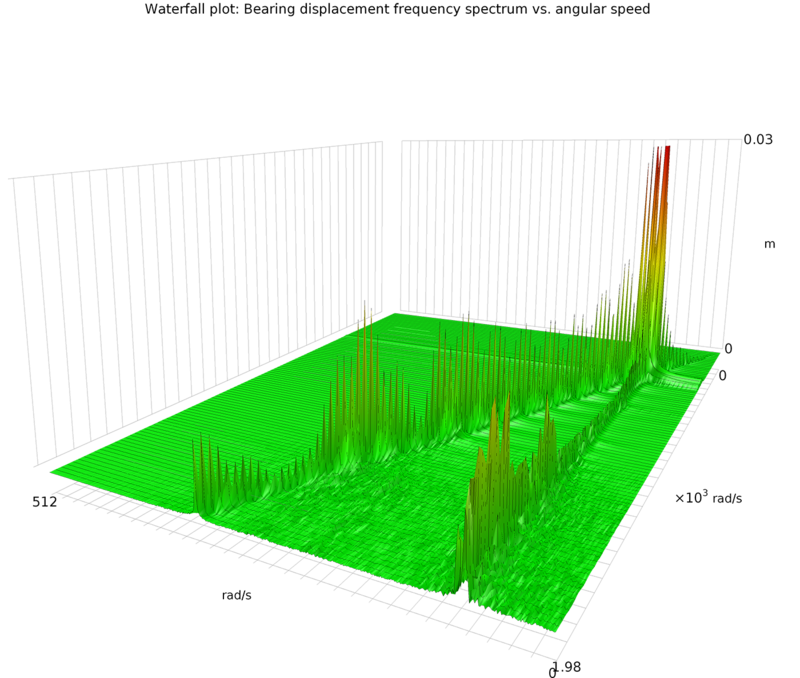 The plot shows the frequency (x-axis, along the front of the plot), angular speed (y-axis, along the side of the plot), and amplitude (z-axis, in the vertical direction of the plot) in 3D. The color plot also shows the amplitude of the displacement. The Solid Rotor interface for modeling a rotor as a full 3D geometric model made with CAD software or using the built-in CAD capabilities of COMSOL Multiphysics®. The Beam Rotor interface for the approximate modeling of a rotor with 1D beams and accompanying components as points. The Hydrodynamic Bearing interface for detailed modeling of a bearing that includes the lubricant film within the bearing. The Solid Rotor with Hydrodynamic Bearing interface for the combined modeling of a 3D rotor and hydrodynamic bearings, as well as the interactions between them. The Beam Rotor with Hydrodynamic Bearing interface for the combined modeling of a rotor (defined as a beam) and hydrodynamic bearings, as well as the interactions between them. By using the multiphysics couplings available in the Rotordynamics Module, you are able to capture the effect of oil whirl and whip through coupling the physics in the Hydrodynamic Bearing interface to those in the Beam Rotor and Solid Rotor interfaces. 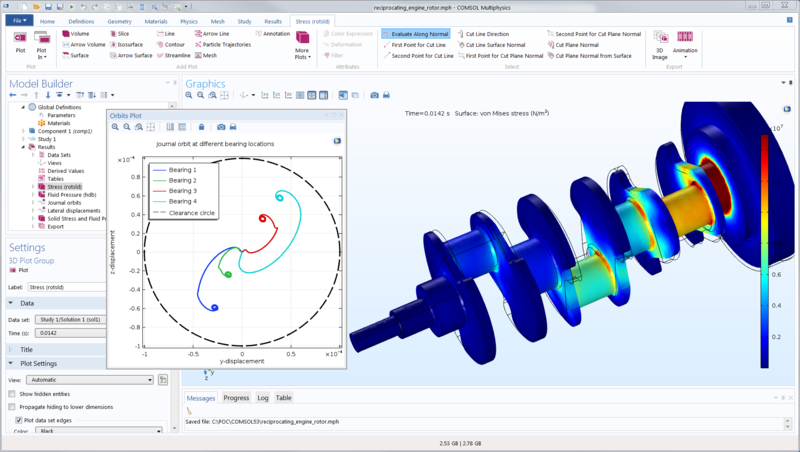 Additionally, you can combine the Rotordynamics Module with other modules in the COMSOL product suite for coupled and multiphysics simulations. 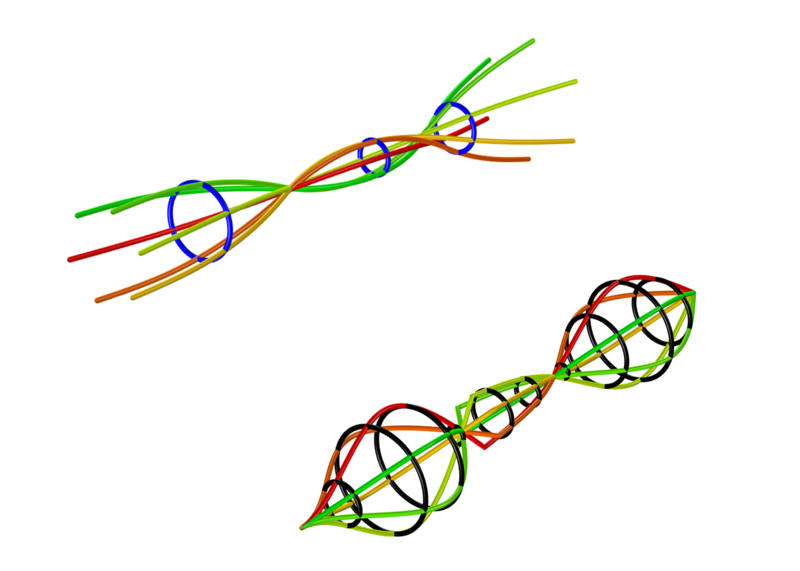 This means that you can examine how other types of physics affect your rotordynamics designs. For example, by combining the Rotordynamics Module with the Multibody Dynamics Module, you can perform a transient simulation to predict the vibrations in a geared rotor assembly for an externally applied torque. To achieve the most accurate description of a rotating machinery assembly, you need to be able to consider all of its participating components. You can use the most general approach to modeling such assemblies, traditional finite element analysis, with the Solid Rotor interface in the Rotordynamics Module. With this approach, you represent the rotor with a 3D geometry and use solid elements to define the rotor assembly. In the Solid Rotor interface, you can include full descriptions of geometrical asymmetries and unbalances in your analysis, as well as nonlinear geometric effects. You can also account for deformations in journals and mountings, consider gyroscopic effects, and capture the effects of spin softening and stress stiffening in your simulation. This interface is most useful if you need explicit simulation results for deformation and stresses in the rotor and its components. If you are looking to perform a computationally conservative simulation, then you can use the Beam Rotor interface in the Rotordynamics Module. With this interface, you are able to approximate the design of rotor assemblies by explicitly modeling the length in only the axial direction using beam elements. This approach is based on linear Timoshenko beam theory. With the equation formulations included in the Rotordynamics Module, you are able to separate the axial, bending, and torsional components of your rotordynamics analysis. You can also add disks at various points along the beam in order to represent various components or foundations on the rotor, or specify these parts with an offset to the rotor. These components can include flywheels, pulleys, gears, impellers, and rotor-blade assemblies, to name a few. You can accurately simulate the deformations in the rotors that have a slenderness ratio of up to 0.2 with the Beam Rotor interface. Information in the transverse directions of the rotor is specified in terms of the properties adherent to a beam, such as cross-sectional surface area and moments of inertia. When using this interface, you assume that the cross-sectional dimensions of the beam are much smaller than the axial length of the rotor, thus neglecting the cross-sectional deformation of the rotor. In this case, the rotor is modeled as a series of disks and beams. Bearings and foundations are essential to a rotor assembly; they are the components that connect a rotor to its surrounding parts. Rotor system responses are very sensitive to the type of bearing or foundation, so you need to be able to accurately describe their behavior. Dedicated interfaces and features within the Rotordynamics Module make these components easy to define. Journal bearings restrict the translational motion of a journal in the lateral direction and its rotation about both lateral axes due to the finite length of the journal. There are two options for modeling journal bearings: either as a full hydrodynamic bearing, with a detailed description of the lubricant's pressure and flow, or by making approximations using lumped models. These bearings are very stiff, so the motion of the journal in the bearing is very small and does not affect the overall response of the rotor. Based on Ocvirk's theory, this bearing model works as a spring-damper system on the journal of the rotor. The dynamic stiffness and damping coefficients can be known or unknown. If unknown, you can evaluate them as a function of the journal motion in the bearing. This model uses a spring-damper system with two translational stiffnesses and damping coefficients in the lateral directions of the rotor, and two rotational stiffnesses and corresponding damping coefficients about the lateral directions. These values are known either by performing experiments or through computer simulation, and can be entered as tabulated data as a function of journal motion. Instead of simulating a bearing, you can also directly apply reaction forces and moments to the journal through experimental data or as functions of the journal's motion. You can model the behavior of journal bearings in detail with the Hydrodynamic Bearings interface. The interface includes predefined physics that make it easy to model the oil between a journal and bushing that acts as a lubricant by solving the Reynolds equation. You can use this model to completely constrain the axial motion of the rotor and rotation about two lateral axes. This is useful when the effect of the bearing is not significant on the dynamics of the rotor assembly. This model uses a spring-damper system with one translation stiffness and damping coefficient along the axis of the rotor, and two rotational stiffnesses and corresponding damping coefficients about the lateral directions. These values are known either by performing experiments or through computer simulation, and can be entered as tabulated data as a function of collar motion. Instead of simulating a bearing, you can also directly apply reaction forces and moments to the collar through experimental data or as functions of the collar's motion. Where the bearing's motion is rigid or does not affect the rotor response significantly. Where the foundation and bearing motion are subject to external vibrations. This can be applied as data, an equation, a function, or from results by solving these effects using other COMSOL Multiphysics® add-on modules. A flexible foundation can alter the critical speed of the rotor and is captured by this model in cases where the equivalent stiffness of the foundation is known. 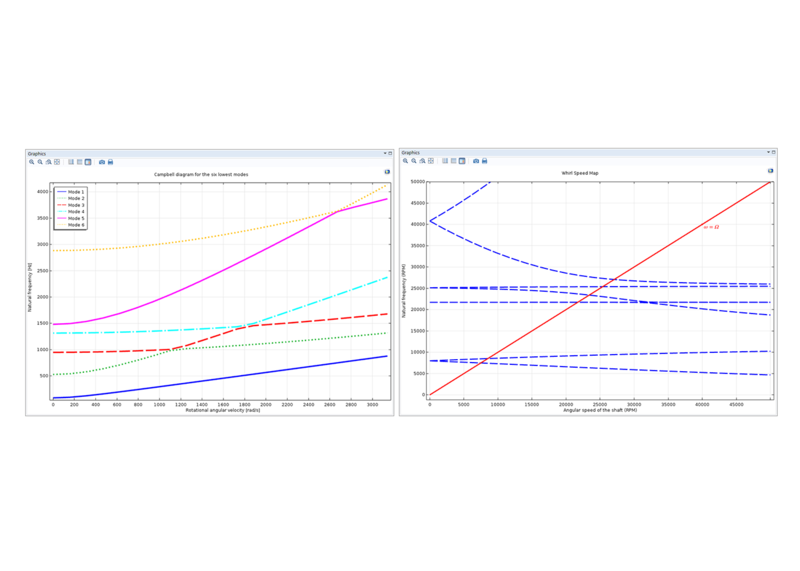 With the range of study types included in the Rotordynamics Module, you can properly analyze the dynamics of a rotor assembly using different analysis techniques that are adapted to the characteristics of rotordynamics phenomena. The Rotordynamics Module enables you to account for gyroscopic effects, including frame acceleration forces. In the module, the vibrational effects are modeled from the perspective of a corotating observer by using a coordinate system that is rotating in sync with the rotor. This simplifies your modeling process, as you do not need to know the actual physical rotation of the rotor in order to simulate the assembly. From the perspective of a corotating frame, conventional intuition of what is a stationary versus dynamic force no longer applies. In a rotordynamics analysis, inertial effects may appear as stationary forces, whereas a gravity force, which is stationary in a traditional analysis, appears as a dynamic sinusoidally varying force seen from a corotating frame. In this way, a stationary study has a different interpretation in rotordynamics than in conventional analyses. The vibrational modes of a rotor will travel in an orbit in either the direction of the rotor's rotation (forward whirl) or the opposite direction (backward whirl). This phenomenon can be analyzed using various eigenfrequency and frequency domain studies, as well as by performing a fully transient analysis using a time domain study. For cases where loads in the corotating frame do not change their magnitude and direction significantly or there is no time dependence in the material model of the rotor, such as viscoelasticity and creep. You can analyze parametric studies, such as a rotor's behavior for different mass eccentricities, using a stationary study and stepping through the different parameters. Solves for the natural frequencies and the corresponding mode shapes for undamped and damped systems, even in cases where the rotor is not fully constrained. You can use the Eigenfrequency Study node to determine the stable operating ranges and critical speeds of the rotor through repeating an eigenfrequency analysis multiple times over a range of angular speeds of the rotor. Computes the response of the rotor if all loads are time harmonic when seen from the corotating frame. For cases where you cannot disregard the inertial effects from unbalances and their changes in time with respect to the corotating frame. Performs a parametric sweep over the rotor's angular speed, while also consisting of a time domain simulation followed by a fast Fourier transform (FFT). Since this study type is computationally expensive, you should mainly use it when the deformation of the rotor plays a significant role in determining the overall dynamics of the rotor assembly. Whirl plots (mode shape), which plot the mode shapes of a rotor about the rotor axis at discrete rotation intervals. Campbell plots, which plot variations of the natural frequencies of the rotor with respect to rotor speed. Waterfall plots, which plot variations of the frequency spectrum as the angular speed of the rotor increases. Orbit plots, which plot the displacement at certain points on the rotor, such as the positions of disks and bearings.